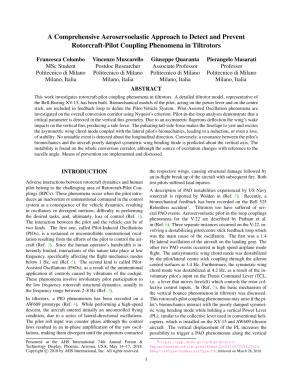 This work investigates rotorcraft-pilot coupling phenomena in tiltrotors. A detailed tiltrotor model, representative of the Bell-Boeing XV-15, has been built. Biomechanical models of the pilot, acting on the power lever and on the centre stick, are included in feedback loop to define the Pilot-Vehicle System. Pilot-Assisted Oscillation phenomena are investigated on the overall conversion corridor using Nyquist's criterion. Pilot-in-the-loop analyses demonstrate that a critical parameter is detected in the vertical fins geometry. Due to an asymmetric flaperons deflection the wing's wake impacts on the vertical fins, producing a side force. The pulsating tail-side-force makes the fuselage to yaw and excites the asymmetric wing chord mode coupled with the lateral pilot's biomechanics, leading to a reduction, or even a loss, of stability. No unstable event is detected about the longitudinal direction. Conversely, a resonance between the pilot's biomechanics and the aircraft poorly damped symmetric wing bending mode is predicted about the vertical axis. The instability is found on the whole conversion corridor, although the source of excitation changes with reference to the nacelle angle. Means of prevention are implemented and discussed.